Budget weddings are becoming increasingly popular as engaged couples prioritise family, friends, and financing their future together instead of splashing the cash on their big day. As a result, DIY and rustic wedding aesthetics are in fashion so there’s no need for a budget wedding to look budget. Here are some low-cost alternatives to on-trend wedding fashions. Brides love the simple and boho wedding dress trend, which conveys an enchanting, stylish, and free-spirited vibe. This trend allows for more opportunities to express your individuality as brides are opting for cute colours beyond the traditional white, such as the pastel blue above. Simple dresses can look timeless and elegant if you know what you want. Find the perfect vintage dress, or go gorgeous and unique with an upcycled and tailored dress just for you. Lighting can have a huge effect on how good your wedding looks. 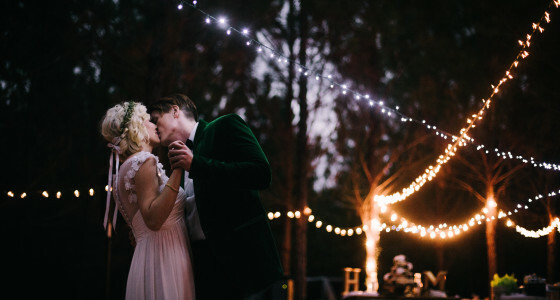 Fairy lights are in popular demand right now, as they quickly (and cheaply) transform any space into an enchanting and sophisticated venue. Be creative with your lighting choices and don’t be afraid to use your surroundings! Fairy lights are very cheap so you can afford to experiment. Handmade wedding favours and DIY decor are perfect for adding a personal touch to your wedding. Make your friends and family feel special on your big day by showing some of your unique flair in invitations and gifts. Try hand-drawing or painting your invitations to show your individuality and personalise each invitation to your loved ones. At the wedding, handmade decor and favours go down a treat. They also look gorgeous without breaking the bank. Cutting costs on wedding photography is often one of the easiest ways to save money without sacrificing quality. Modern DSLRs make it easy to take beautiful photos without the need for extensive training. Plus, most people have at least one friend who dabbles in amateur photography. Ask around and see if you can get a friend (or two!) to capture the big day for you. Pay attention to the details to really pull a budget wedding together. It’s easy to oversee small things like accents and colour schemes, but the details bring your event to life. Use budget details that tie in with your theme, like hessian ribbons for a rustic feel or pastel linens for a spring wedding. Perfectly co-ordinating your decor will elevate your wedding, no matter the theme - or the cost! Instead of forking out for a waiting service, opt for a communal eating experience instead. Currently on-trend are ‘design-your-own’ dessert options and big eats like hog roasts and barbecues. Not only do these options save you money, they give guests a chance to mingle and make your wedding dinner a unique, social experience. If you want to go all out, get your guests to bring dishes and drinks themselves! This is a great way to get your loved ones to feel involved on the day. The best way to boost your budget wedding is to upgrade and upcycle. The online wedding planning community is full of tips, tricks, and hacks that can help you make the most of your budget while still throwing the event of the year! Remember that spray paint can glamorise anything, and natural venues are easily transformed into enchanting wonderlands. Be creative, be inventive, and have your dream wedding while planning for your future. Sign up to PensionBee and we’ll combine your old pensions into a new plan that you can manage online.